Kenny Rogers Roasters is a chicken restaurant that was started in 1991 in the United States by country music musician Kenny Rogers and former Kentucky Fried Chicken owner and original developer John Y. Brown, Jr. The menu was originally centered on wood-fired rotisserie chicken. In 1998, the company went through a restructuring, which resulted in its acquisition by Nathan’s Famous, Inc., completed on April 1, 1999; as a result of restructuring, many locations closed. 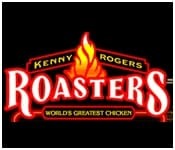 Today, according to Nathan’s Famous corporate web site, there is only one Kenny Rogers Roasters still operating in the United States located at the Ontario Mills mall in Ontario, California.